Double Width is 4 5/8 In. Maximum Height using any silhouette is 8 In. 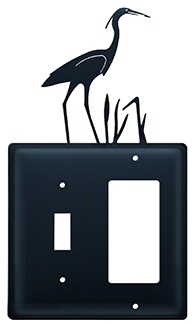 Our Electrical Wall Covers, Switchplates, Outlet Covers, and GFI/Rocker Covers have a baked-on black satin matte powder coat finish. *This item is MADE TO ORDER and is NONCANCELABLE once ordered. Allow up to 12 to 16 weeks for delivery. This American made wrought iron electrical wall cover is handcrafted in Fabius, New York, by Village Wrought Iron.